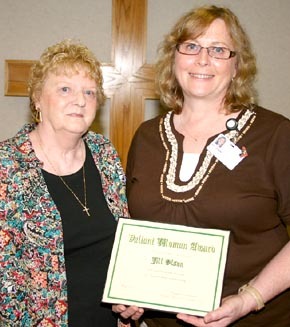 Jill Olson of Albion was honored with the Valiant Woman Award by Church Women United during their annual May Friendship Day program last Friday, May 4, at the chapel of Good Samaritan Society – Albion Wolf Home. 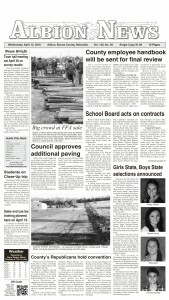 Olson was recognized for her fund-raising efforts on behalf of GSS-Albion, including raising funds for the new 20-bed nursing home wing now under construction. She was also honored for her compassion and caring for the nursing home residents, and for sharing her face with them. Details in the May 9 Albion News Print & Electronic Editions.